Life is good. I live in NYC, the greatest city in the world. I am in a wonderful relationship with the most kind, generous and compassionate man I have ever met. I am a "wanna-be" artist and taught a basic computer class at a day program for people living with AIDS and HIV and homeless people here in NYC, called Housing Works, Inc., for 5 years. I loved this job. I love turning people onto the amazing opportunities they can find on the internet. Opportunities to learn and to connect to others. It is especially helpful for people with disabilities, as there are a wealth of support groups, medical information and access to a world they might otherwise be cut-off from. For the past 3 years I have been working as Program Assistant and more recently Data Manager in COBRA Case Management Services. My current job is challenging and I enjoy it, but teaching will always be my passion. I am also active in AIDS Advocacy, mostly through my job, and participate in a lot of events and direct actions to help bring light and legislation to the awful travesty of the AIDS pandemic, both at home and abroad. I am involved in the Campaign to End AIDS (C2EA), a national grass roots movement dedicated to this mission. You can can visit their website here and read more about it in the Advocacy section. I totally believe that each of us CAN make a difference, and have a responsibility to do so. You can be part of the problem or part of the solution. You would be surprised at the 'ripple effect' that your efforts can produce and the lives you can touch by even the smallest effort. "Life is God's gift to you, what you do with it is your gift to God"
My husband is a carpenter and a contractor. He is one of those "Mr. Fix-it" kinds of people who can fix or build anything. You can see some of his projects at his site, Gilrob Contractors. We're a great pair, I break things and he fixes them! LOL. His 'day job' is Chief Maintainer at The New Museum of Contemporary Art in NYC. They opened in their brand new building in 2007, the first museum built from the ground up in Lower Manhattan. It's located on the Lower East Side on the corner of Bowery and Prince. It's a pretty fascinating place. The building itself is a work of art. He loves working there. Some pics of my family can be found here. I had the most spoiled pet in the world, a rabbit named Bugsy. Unfortunately he passed away a few days after New Years 2008. He was around 9 - 10 years old. We got him when he was around 2 from one of my students. I never knew what great pets rabbits can be and he had become the most spoiled member of our household! You can see him here. He had become paralyzed in his back legs. But he kept us fascinated and laughing at his antics and gave us so much joy. To see our some of our other critters, QueekQueek, the Guinea Pig (whatta handsome guy! ), click here and our other little guy, aptly named, Little. We got a PUPPY (1/2008)!!! He is the sweetest little boy and we decided to name him "Bugz". This is in honor of my Bugsy rabbit - it's "Bug + Z = Bugsy" but pronounced "Bugs". It fits him, he looks like a little Bugz! He is a French Bulldog and you can see him here. Other Updates (6/2008): We just moved from the Bronx, where we had been living for the past 7 years to Staten Island. It is a cool little house one block from the beach, in a QUIET, clean neighborhood. Commuting time to work in lower Manhattan now is easy and affordable (with EZ Pass commuter plan). Although most people say "Staten WHERE?" when I tell them where I've moved, I think this is one of the last commutable, affordable places left to live if you work in Manhattan. There's even an express Manhattan bus on my corner that takes you one block from my job during rush hour! I am definitely looking forward to the summer of 2008 at the beach. Bugz even loves it! Update (9/2008): See pictures from a week long long road trip (C2EA Pt 2) to the first presidential debate between McCain and Obama in Oxford, Mississippi. Update (10/2008): Got a promotion and raise at work. My new title is Program Assistant/ Data Manager. It's a little more responsibility and money, and it feels good to be recognized for what I do and for the job I do to be acknowledged. Looking forward to a new phase at work. Looking forward to our first winter in our little beach house. Update (11/2008): So happy to be alive to witness the history making election and to welcome Barack Obama as our new President of the United States. I have never been more grateful to have been blessed with the opportunities that recovery has granted me, especially the chance to see this. Check out the website of our President - www.change.gov. Update (6/2009): Had a great, relaxing Memorial Day upstate. Now we're really excited for the start of the 2nd summer in our little house by the beach. Also excited that my son, Chris and his fiance, Denisse are getting married in August of this year. Watch for pics of the grand kids!! At work, we just started fundraising efforts for our trip to the 2010 International AIDS Conference in Vienna next summer. Donate to a great cause! Update (8/2009): Chris and Denisse's wedding was absolutely amazing! We had the best time, they are officially Mr and Mrs Starks. Check out pics here. Summer is winding down and I'm sad to see it go! Update (04/10/2010): Just got back from a great, much needed, family vacation in S Florida Keys. Spent time with Gil, son, Chris, daughter in law, Denisse, step daughter, Delilah, and my brother, Scott in Islamorada and Key Largo, and Boca. It was also bittersweet because it was the last time we will be at my mom's condo. The closing for the sale is next week. Some great pics of us and some spectacular sunsets are here. On another note, July is quickly approaching and so is the 2010 International AIDS Conference in Vienna. We (staff and clients at my agency) have been planning and fundraising for this event for the past year, and it is finally almost here! So excited to go to Vienna! If you want to help our efforts, you can go to my secure fundraising page and donate a few tax deductible dollars- smile. It's here (or click on the widget on the right side of this page)- Thanks! Update (12/18/2010):The holidays are here and it's a great time of year. We have so much to be grateful for this holiday, it's been an amazing year. Still looking for that house, but content with things just the way they are really. I really wouldn't change a thing. (Well, maybe just that 'lottery thing', I'd win! lol). My resolution this year is to find some time to do a long overdue update of this site and focus on web design skills (which are pretty rusty), among other things. Happy Holidays everyone! 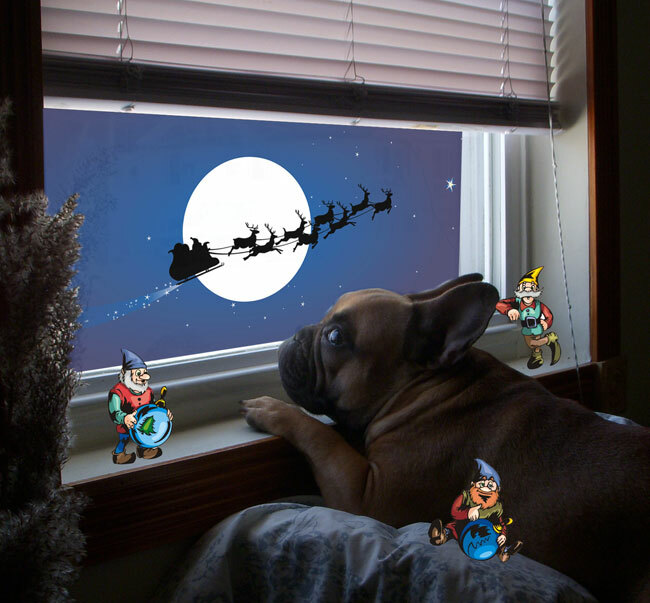 Here's our Holiday Card this year, starring Bugz, of course.